This week we want to introduce a central member in our UDHA team, Jairus Mwase. Jairus is not only important in his role as field officer at UDHA but also invaluable in bridging the organization with the community. 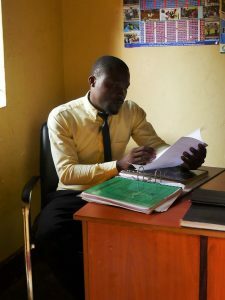 With his background in social work, and good people skills, Jairus has created trust and understanding in the different communities, which has been key for UDHA’s success. Jairus began his career in social work when he was still in school, when he was appointed as a peer educator around the age of 14-15. He was social and respected and worked with sensitization issues among his peers, before he moved onto social work. While attending a career fair on public health issues, Jairus found out about UDHA’s work and sent in a job application. He has worked for the organization for three years while doing a Diploma in Social Work. What Jairus likes most about his job is the combination of doing what he loves, serving communities, and changing and saving lives. Challenges around his work include the government not always complying with the advocacy efforts of UDHA and other similar NGOs. By law, each parish is supposed to have one healthcare centre but this is rarely the case. Some communities are also resistant to interventions and tend only to comply if material objects or hand- outs are distributed, or they see specific benefits or incentives for themselves. Due to traditional perceptions of men’s and women’s roles as well as lack of financial resources, some men also have the perception that maternal health only is of women’s concern and therefore shy away from responsibility and expenses associated with pregnancy. In the time that UDHA has worked with island communities in different villages, Jairus has seen the renovation and uplifting of clinics that have been fitted with solar panels and fences. UDHA has also provided healthcare services for the community and sensitization about health as a fundamental human right. With regard to the impact and changes for maternal health as a result of the Maama Project, Jairus has conducted a survey that showed that many women expressed that they would be willing to buy the Maama kit if it was not distributed as it is currently (for free after completing four antenatal care visits). Jairus thinks that some people thus have changed their mind-set because of education and awareness around mother and child health. Despite improvements, Jairus believes that projects such as the Maama Project will continuously be needed due to the difficulties in reaching everyone on the ground. In terms of his own career, Jairus wants to focus on completing his education and training in social work and thereafter do a Masters in Public Health. In addition to his academic studies Jairus would like to gain experience from working with social work at different levels in the community. When he’s not working, Jairus likes to play volleyball and listen to music, socialize with friends, talk about social life and society, read current literature and stories as well as compose his own music with friends. He also likes traditional and street dancing.